This is one of my very favorite quotes in all the world. And it comes from one of my very favorites stories. My daughter-in-law’s mother, Susan, was a wonderful seamstress. President Kimball lived in their ward. One Sunday, Susan noticed that he had a new suit. Her father had recently returned from a trip to New York and had brought her some exquisite silk fabric. Susan thought that fabric would make a handsome tie to go with President Kimball’s new suit. So on Monday she made the tie. She wrapped it in tissue paper and walked up the block to President Kimball’s home. Susan didn’t have an assignment to make that tie. She wasn’t hired to do so. Despite feeling a bit hesitant, she did it because itfelt right. Susan had a quiet sense of mission to serve others. I was also the beneficiary of such service. Her service went beyond any calling because it lasted throughout her life. Never suppressing a generous thought became a part of her personal ministry. I have had so many moments like this in my life. The little whisper of inspiration comes saying, "Do this small thing. This person needs it." And it's such a faint whisper of a thought that sometimes I don't recognize it for what it is: an invitation to be an instrument in the hands of the Lord. We read in the scriptures that, "by small and simple things are great things brought to pass." (via) This is something I can attest to because I see it so often in my own life. I see it over and over and over again. 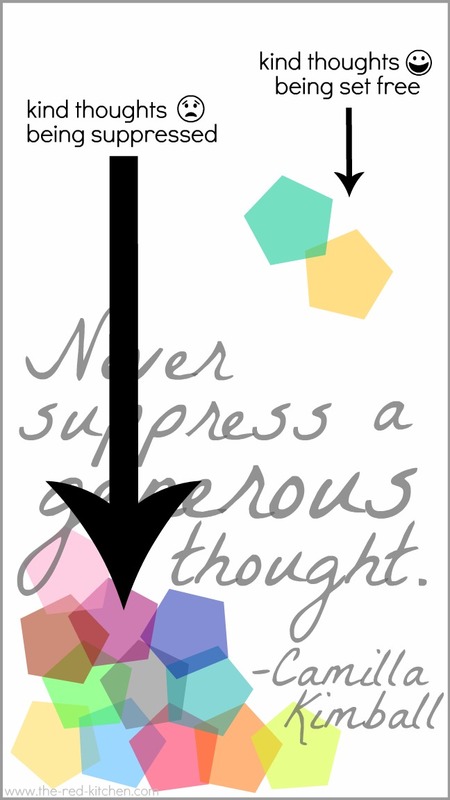 And, many times, these small and simple things start out as nothing more glamorous than a simple generous thought. 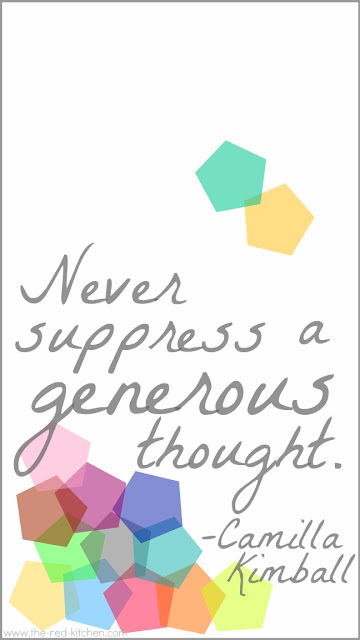 More often than not, these generous thoughts are simple. "We have too much _______ and there's no way we're going to use it all before the expiration date. Maybe I'll ask _______ if they'd like to have some." "I think _______ would really like this." "Maybe _______ would like to come with us." Most times we never know how much these simple, generous thoughts--which then turn into simple, generous acts--mean to their beneficiaries. There is "sorrow that the eye can't see." (via) And it's my own little thought that, most of the time when the Lord calls on us to do some little kind task, we're helping heal those hidden sorrows. Each one of us are angels in the eyes of those we serve. My sister-in-law Anna sent me an e-mail earlier today asking if I could do her a little favor. 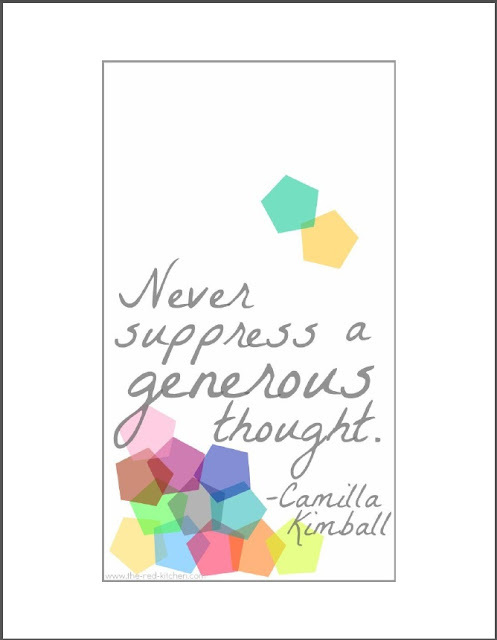 She said that she's helping put together a Relief Society meeting next month and she wanted to include a handout with the quote, "Never suppress a generous thought." 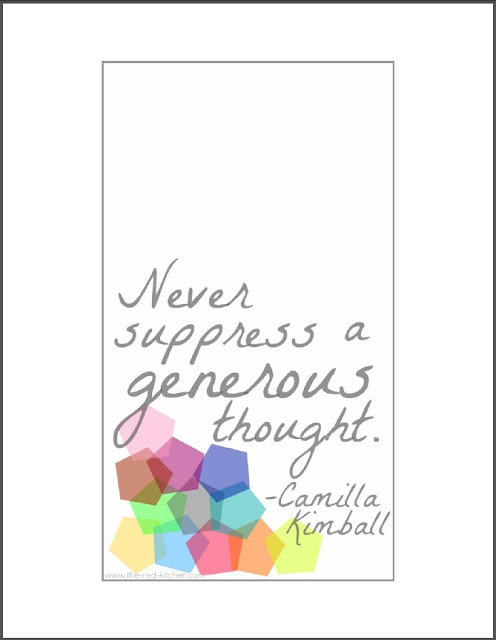 She asked if I could help her make something with the quote on it that was bookmark size which she could give to the women in her ward (congregation). She said they were also going to display this print (which I love) at the meeting, so if I could make something that sort of matches that would be good. Well, I love the quote and I love Anna, so I got to work on it right away and came up with two (very similar) versions. I'm all for setting those generous thoughts free, so even though version 2 is a little more cluttered in the design, there's that something about it that speaks to me more. Okay, well now that you've had that little insight into my designer-wanna-be thoughts, I'll let you print off whichever one you like. 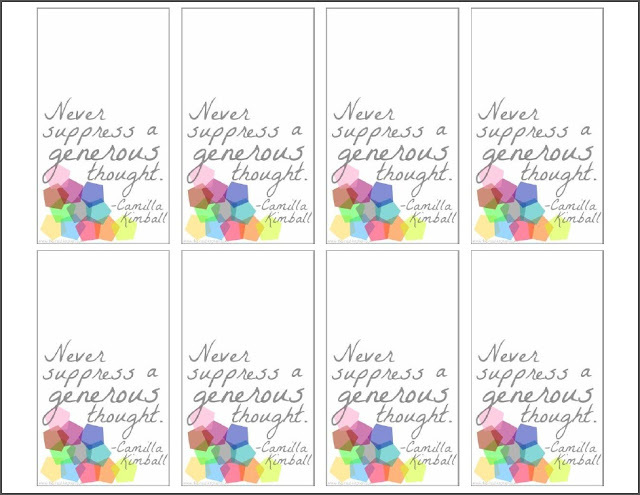 :) Ready for some free printables? Just click on the images below to print off the version and size you'd like. Each version comes in a large size (meant for 8 1/2" x 11" paper) and a smaller bookmark size which prints 8 to a page (also meant for 8 1/2" x 11" paper). Click HERE or on the image above to view and print the above design. FYI: Just by way of warning, when you click over and see these designs in Google Docs, they look really pixelated, but I printed out a copy of each one directly from Google Docs and they print out just fine (i.e. not all pixelated like they look on the screen). I love this! I actually think of this quote all the time. I was at the devotional when this story was told at BYU and it has stuck with me! 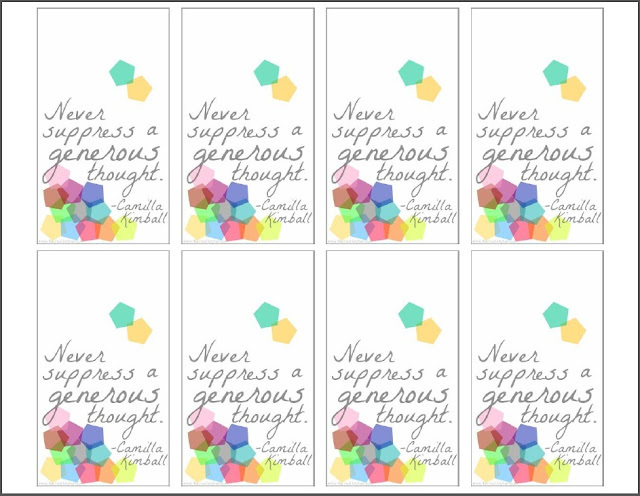 Thanks for the cute printable Katie! Thanks Katie! I also think about this quote all the time and have thought frequently that I should have it displayed somewhere, now if I can just get our semi functioning printer to cooperate, I'll be printing it right off! Thanks for this quote reminder! Was just put in as RS Pres and someone mentioned it to me the other day and I've been using it as my mantra of late. I am going to center it around my lesson on Sunday, so I appreciate you letting me print these off for handouts. Cheers!